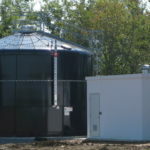 Your water storage tank is one of the most valuable assets at your facility, why not take care of it? 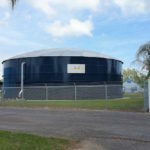 Water storage tanks need to be periodically inspected and cleaned to help maintain good water quality in the distribution system and to help extend the life of the tank. Regular tank inspections can also help to identify small problems that may develop into major problems that can create health related issues, lead to costly repairs or premature tank failure. Tanks that are not periodically cleaned can cause contamination events that can harm human health or can contribute to aesthetic complaints. Wet inspections are typically by certified divers or remote operated vehicles (ROVs). Wet, water quality inspection is what the state typically requires. Dry inspection is normally a result of issues seen in Wet inspection. Dry inspections are typically done only for coatings check for structural damage and mil thickness, steel tanks are checked for gauge thickness. NOTE that dry inspections require the tank to be drained and out of service. Dry inspection as described are typically 3x the cost of a Wet inspection. 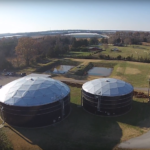 How often should a water system inspect and clean storage tanks? The inspection and cleaning interval can vary based on the type of tank and water quality. Generally, a water storage tank should be inspected at least every five years, or more often, depending on State requirement. Cleaning and repairs should be addressed based on the findings of the tank inspection. Additional inspections between maintenance intervals are encouraged. 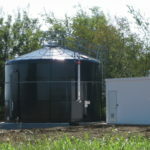 Most states do not certify tank inspectors. Before you hire any inspector, ask for copy of a standard report that coincides with the tank in question. Verify that the report is acceptable to the state regulatory agency. With the pending 2017 water quality rules, it is advisable to hire only inspectors who capabilities/equipment can provide in service temperature readings to identify stratification. Circulation is the key to preventing stratification of the water within a tank. As a side note, with proper circulation and water turnover, freezing of potable storage tanks should not occur. Typically, water is added and drawn from the bottom of the water container through inlet and outlet piping. When the fill rate is greater than the draw rate the water level rises. When the draw rate is greater than the fill rate water level lowers. If the fill and draw rate remains consistently equal than the system is drawing the water just added. 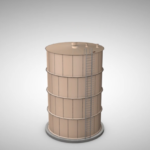 What results is the water at the top of the container sits with no circulation leading to stratified and stagnant water. Also the chlorine which remains in the stagnated water can become depleted, leading to microbial growth as well as tastes and odors. A common and economical way to prevent this is to add mixers to your tank to help with these issues.